Saturday, April 20, 2019 from 9:45 AM to 1:45 PM (7 seats left)Eden Prairie - 7905 Golden Triangle Dr.
Saturday, May 18, 2019 from 9:45 AM to 1:45 PM (8 seats left)Eden Prairie - 7905 Golden Triangle Dr.
Saturday, June 15, 2019 from 9:45 AM to 1:45 PM (11 seats left)Eden Prairie - 7905 Golden Triangle Dr.
Saturday, July 20, 2019 from 9:45 AM to 1:45 PM (12 seats left)Eden Prairie - 7905 Golden Triangle Dr.
Saturday, August 17, 2019 from 9:45 AM to 1:45 PM (12 seats left)Eden Prairie - 7905 Golden Triangle Dr.
Saturday, September 21, 2019 from 9:45 AM to 1:45 PM (12 seats left)Eden Prairie - 7905 Golden Triangle Dr.
Saturday, October 19, 2019 from 9:45 AM to 1:45 PM (12 seats left)Eden Prairie - 7905 Golden Triangle Dr.
Saturday, November 16, 2019 from 9:45 AM to 1:45 PM (12 seats left)Eden Prairie - 7905 Golden Triangle Dr.
Saturday, December 14, 2019 from 9:45 AM to 1:45 PM (12 seats left)Eden Prairie - 7905 Golden Triangle Dr.
Those needing BLS re-certification in addition to ACLS should also register for our online BLS class. Details for this will be included in your confirmation E-mail. Designed to aid the pediatric healthcare provider in developing the knowledge and skills necessary to efficiently and effectively manage critically ill infants and children, resulting in improved outcomes. This class is approximately 12 hours and typically completed in two classroom sessions. Upon registration you will be given access to the online portion of this class. Simply follow the link provided and click 'activate course' to start your training. You may start and stop your progress as needed. Upon completion, you will then need to come to a skill session to demonstrate the hands on skills to receive your certification card (this is the same certification card as a classroom session). Sign up for your skill session below. Online coursework must be completed prior to your session. The online portion is designed to take approximately 10 hours so please plan accordingly. Please note that there are no refunds for online courses or the access codes/links per AHA vendor policy. If you fail to show or need to cancel the price of the access for the online course can not be refunded (prices found on https://worldpoint.com). Please feel free to contact us with any questions or conerns prior to registration. Upon registration you will be given access to the online portion of this class. Simply follow the access link provided and click 'activate course' to start your training. You may start and stop your progress as needed. Upon completion, you will then need to come to a skill session to demonstrate the hands on skills to receive your certification card (this is the same certification card as a classroom session). Sign up for your skill session below. Online coursework must be completed prior to your session. The online portion is designed to take approximately 14 hours so please plan accordingly. Please note that there are no refunds for online courses or the access codes/links per AHA vendor policy. If you fail to show or need to cancel the price of the access for the online course can not be refunded (prices found on https://worldpoint.com). Please feel free to contact us with any questions or conerns prior to registration. Upon registration you will be given access to the online portion of this class. Simply follow the access link provided and click 'activate course' to start your training. You may start and stop your progress as needed. Upon completion, you will then need to come to a skill session to demonstrate the hands on skills to receive your certification card (this is the same certification card as a classroom session). Sign up for your skill session below. Online coursework must be completed prior to your session. The online portion is designed to take approximately 4 hours so please plan accordingly. Please note that there are no refunds for online courses or the access codes/links per AHA vendor policy. If you fail to show or need to cancel, the price of the access for the online course can not be refunded (prices found on https://worldpoint.com). Please feel free to contact us with any questions or conerns prior to registration. This course is for anyone needing to satisfy OSHA Bloodborne Pathogens. It is designed for healthcare providers and is approved for tattoo artists. AHA Web-based eLearning course uses online modules, video segments, and interactive exercises to teach students how to protect themselves from bloodborne pathogens and how to properly handle and react to blood in the workplace. Body artists only: The Department of Health has changed it's requirements for body tattoo artists. You must take 5 total hours of approved bloodborne pathogen training for licensure. This session is approved and will count for ONE of those hours. If desired an in person session may be arranged as well for an additional hour with topics to include: Bloodborne Pathogens, Prevention of Disease Transmission, Aseptic Techniques and Infection Control. Please note there are no refunds for any online course keycode once purchased. This Web-based eLearning course uses online modules, video segments, and interactive exercises to teach students how to protect themselves from bloodborne pathogens and how to properly handle and react to blood in the workplace. May be used for initial or renewal certification. Students who successfully complete the course will receive a completion certificate. PC and Mac® compatible. Please include an e-mail address when ordering. The access key and instructions on how to log in and register for the course will be e-mailed to you with further direction upon registration. Upon registration you will be given access to the online portion of this class. Simply follow the access link provided and click 'activate course' to start your training. You may start and stop your progress as needed. Upon completion, you will then need to come to a skill session to demonstrate the hands on skills to receive your certification card (this is the same certification card as a classroom session). Sign up for your skill session below. Online coursework must be completed prior to your session. The online portion is designed to take approximately 6 hours so please plan accordingly. Please note that there are no refunds for online courses or the access codes/links per AHA vendor policy. If you fail to show or need to cancel, the price of the access for the online course can not be refunded (prices found on https://worldpoint.com). Please feel free to contact us with any questions or conerns prior to registration. Upon registration you will be given access to the online portion of this class. Simply follow the access link provided and click 'activate course' to start your training. You may start and stop your progress as needed. Upon completion, you will then need to come to a skill session to demonstrate the hands on skills to receive your certification card (this is the same certification card as a classroom session). Sign up for your skill session below. Online coursework must be completed prior to your session. The online portion is designed to take approximately 3 hours so please plan accordingly. Please note that there are no refunds for online courses or the access codes/links per AHA vendor policy. If you fail to show or need to cancel, the price of the access for the online course can not be refunded (prices found on https://worldpoint.com). Please feel free to contact us with any questions or conerns prior to registration. This course is for anyone needing to satisfy OSHA Bloodborne Pathogens Training. It is designed for healthcare providers and is also approved for tattoo artists. This AHA Web-based eLearning course uses online modules, video segments, and interactive exercises to teach students how to protect themselves from bloodborne pathogens and how to properly handle and react to blood in the workplace. Body artists only: The Department of Health has changed it's requirements for tattoo artists. You must take 5 total hours of approved bloodborne pathogen training for licensure. This session is approved and will count for ONE of those hours. If desired an in person session may be arranged as well for an additional hour with topics to include: Bloodborne Pathogens, Prevention of Disease Transmission, Aseptic Techniques and Infection Control. Please note there are no refunds for any online course keycode once purchased. If you have already completed part 1 of an online course and need to complete parts 2&3 (the practice and skills test) for a course you may purchase this option. Please register here for the BLS Instructor Course. More details will follow. 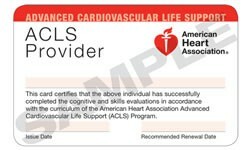 Prior to class all students must possess a valid CPR certification card from the AHA AND take the online instructor essentials course (+$30 - instructions in email, this class only needs to be taken once when you first become an instructor). The process is to take the online essentials class, then the instructor class, purchase course materials and be monitored teaching a portion of one of our courses (often completed the same day with your instructor course). Dues for 2 years are sometimes required by your Training Center. Upon successful completion of all of these steps you will become an AHA instructor. Details on course materials, costs etc will be covered in the instructor course. Emergency Medical Responders, also known as First Responders, provide immediate lifesaving care to critical patients who access the emergency medical services system. EMRs have the knowledge and skills necessary to provide immediate lifesaving interventions while awaiting additional EMS resources to arrive. EMRs also provide assistance to higher-level personnel at the scene of emergencies and during transport. Emergency Medical Responders are a vital part of the comprehensive EMS response. Under medical oversight, Emergency Medical Responders perform basic interventions with minimal equipment. Upon completion students who pass will be Minnesota EMR certified and have the option to take the national registration exam. Emergency Medical Responders, also known as First Responders, provide immediate lifesaving care to critical patients who access the emergency medical services system. This is a blended learning course including some online work and in classroom practical skills to certify or recertify students as Emergency Medical Responders. Upon completion students who pass will be Minnesota EMR certified and have the option to take the national registration exam. Emergency Medical Responders, also known as First Responders, provide immediate lifesaving care to critical patients who access the emergency medical services system. EMRs have the knowledge and skills necessary to provide immediate lifesaving interventions while awaiting additional EMS resources to arrive. EMRs also provide assistance to higher-level personnel at the scene of emergencies and during transport. Emergency Medical Responders are a vital part of the comprehensive EMS response. Under medical oversight, Emergency Medical Responders perform basic interventions with minimal equipment. This is a recertification course taught over 1 -2 days.